Vault of Light: Technically only one expansion late! Technically only one expansion late! Last night I managed to get an Ulduar twenty five run and finally finished off my Yogg with zero keepers netting me a fair few achievements and my Ironbound Proto Drake from Glory of the Ulduar Raider. I didn't raid twenty fives during Wrath of the Lich King so I've had to get most of the achievements through pugs but I've been lazy with it. With MoP coming and the new account wide mount system I decided it was finally time to finish it off! I love him, he's one of my favourite mounts in game. The amount of times I've tried to do sporeloser in pugs is ridiculous, someone always does an accidental cleave or had a buff that does damage when attacked etc. 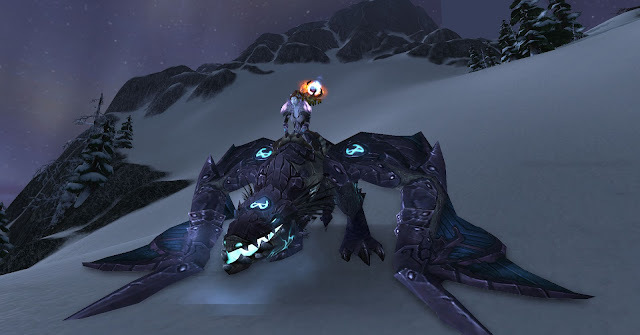 I am missing the one achievement for Sindragosa in Icecrown Citadel for my 25 man drake there... Hope I will get around to doing it one day.